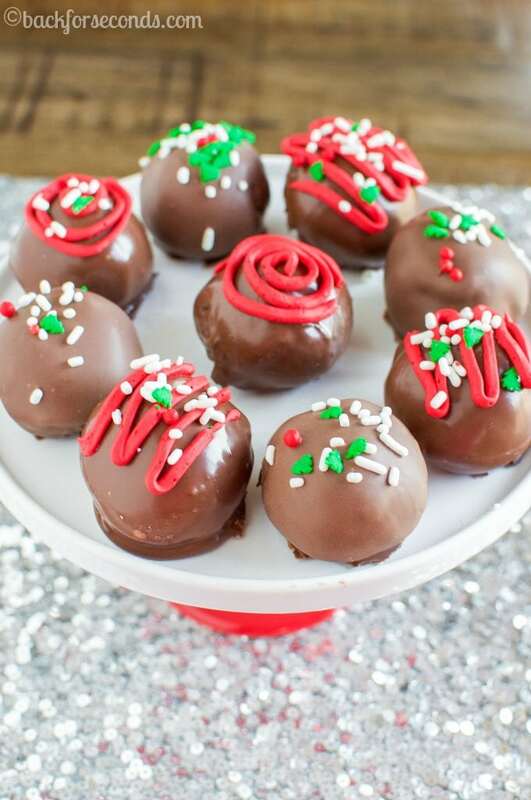 These Easy Chocolate Peppermint Truffles are perfect for Christmas gifts and cookie trays! They are simple to make, pretty to look at, and really delicious! Thanks to the J.M. Smucker Company for sponsoring this post. This is such a festive, easy christmas dessert that gets kids and adults excited! Who doesn’t love a rich, chocolate truffle? Especially when they’re decked out in red and green and sprinkles! I have had the pleasure of teaming up with Pillsbury this year to bring you fun holiday recipes! Did you know that 2015 marks the 50th Anniversary of the Pillsbury Doughboy? 50 years full of cookies, cakes, frostings, and more that make it easy to bake in a pinch! They sent me a package of goodies, and I was just as excited as my kids were to see what was inside and start baking! Immediately I knew what to make when I saw the chocolate cake mix and peppermint frosting. Cake balls!! This is kind of a throwback recipe. About 10 years ago these little treats were super popular, and then they sort of disappeared. So I am bringing them back – holiday style! I love chocolate and mint together year round, but especially during Christmas time. These are seriously a cinch to make, and they’ll get you in the holiday spirit in no time! I used a bit of Pillsbury Red Vanilla frosting and Christmas sprinkles to dress these up, but you could leave them plain, or use different sprinkles to fit any occasion. 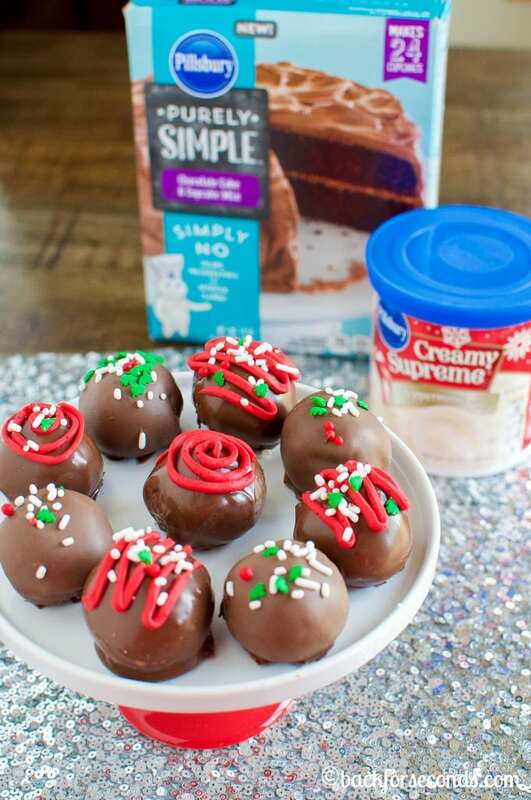 Have you made Cake Truffles before? What’s your favorite flavor combination? Happy birthday to the Dough Boy! 😀 And I love how festive and fun these are. So perfect for Christmas! Believe it or not, I have never in my life made cake balls! 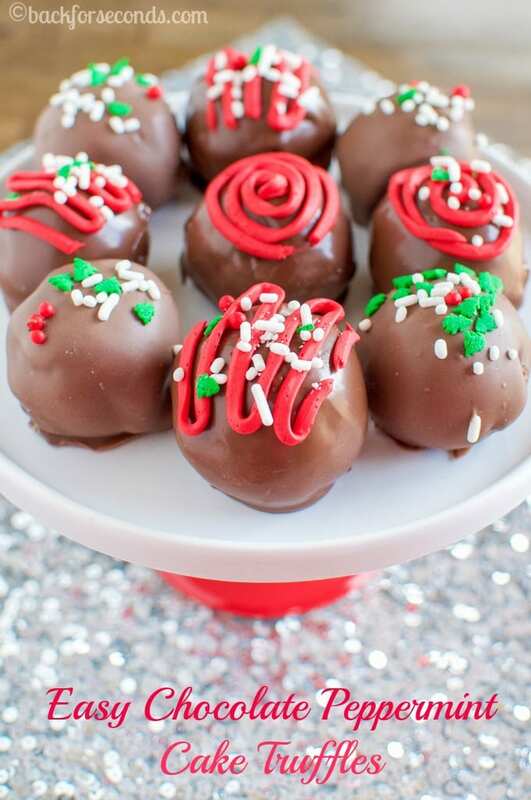 These sound so perfect for the season, I love peppermint and chocolate together. These look so rich and delicious. They’d make great gifts too. I lurve cake truffles in any form. 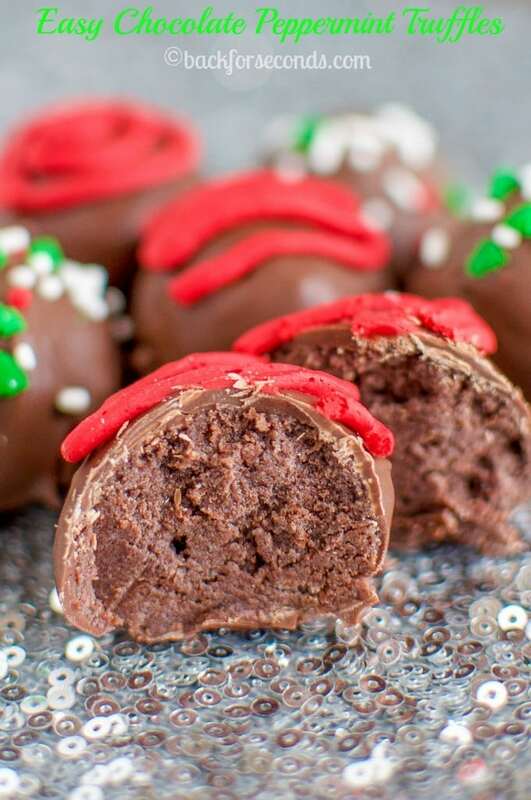 The hint of peppermint in these cake truffles really carries the flavor of the season. The filling in these truffles looks absolutely amazing! What a fun thing to do with all of those ingredients. I had no idea that 2015 was the 50th Anniversary of the Pillsbury Doughboy! I have a Pillsbury Doughboy cookie jar and I love it! haha. Love these little truffles! Chocolate and peppermint are so good together! Ha – these are too cute and SO easy to make!! Excellent idea for Christmas gifts. I love it! Yummo, love this flavor combination. Perfect addition to cookie trays! These look absolutely devine! I know Christmas has just past and am certainly in health kick mode, but I feel as though I’m going to have to give these a try.